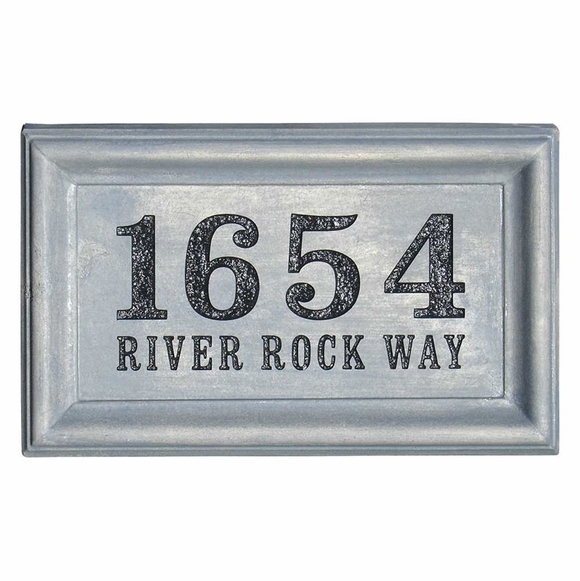 Personalized Cast Concrete Address Block - - ready for installation into a brick, stone, or concrete wall. Available with two lines of personalized printing, one line of personalized printing and a logo, or a single line of personalized printing. Line 1 holds up to four (4) characters. Line 2 holds up to fourteen (14) characters. If you are ordering the optional logo instead of Line 1, please leave the Line 1 input box blank. And two block finishes: smooth standard or rugged, textured travertine. Twenty-six optional logos: bass, bear, bull, butterfly, cat, dinosaur, dog, elephant, elk, moose head, flying ducks, flying pheasant, frog, hammer head, heron, horse, horse head, lion, marlin, rhino, rooster, running horse, salmon, shark, whale, and wolf. Printing and logo color: black. Rectangle dimensions: 15.5"W x 9.5"H x 2.5"D; weighs 20 pounds.